The following spaces or properties are available now for rent or sale as indicated. Click through the title for more information. Located at the intersection of the busiest streets in town it is a great spot for a business seeking prominent drive-by and foot-traffic presence. Click through for full details about the location, size, and rent. This space is up for renewal fall 2015 and could be available as soon as Nov 2015. If you are interested please contact us and we can show you the office. This is the 2nd floor rear office space, and is 186 sqft and includes a kitchenette area with a sink. The following is a project underway with our associates Quest Builders. 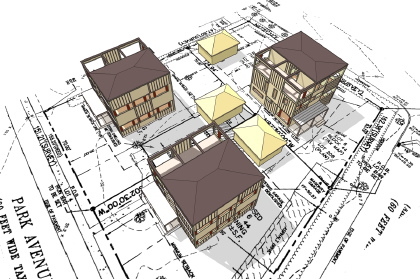 Quest is an infill developer, frequently building new homes on subdivided in-fill lots and small tracts in the New Jersey suburbs of Philadelphia. Quest is now offering modern house designs from the LamiDesign Modern House Collection on all their available lots. Click through for more information on these sites in Maple Shade, NJ. 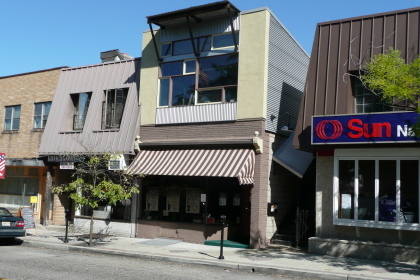 As a note of interest Quest constructed the addition that is our offices seen in the photos of the 45 South Centre Street project in Merchantville, shown elsewhere on the site. They can build modern. This former dairy processing plant on the border of Merchantville, NJ is an ideal conversion to residential lofts, bringing an urban living experience to a garden suburb. The existing building is brick and concrete, and converts over to 9 units of 1-3 bedrooms in size. On site parking behind the building is convenient for residents and leaves a park like front yard for shared outdoor space. 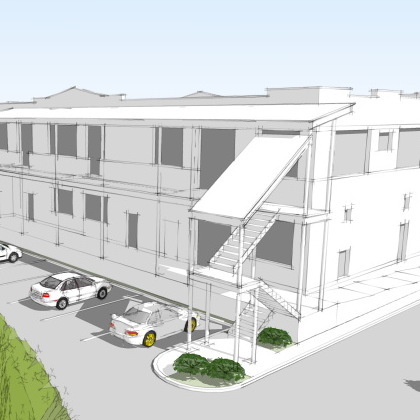 This industrial building is set on a residential street of single family homes, and the conversion to residential lofts will solidify the residential character of the street. The project is set to capture first time home buyers coming out of the housing bubble and not ready to move into a single family home. The setting is an ideal mix of urban living in a suburban setting. Contact us if your are interested in this project. The following projects are either underway or not out of lease yet, but coming up in the near future. If you are interested in any of the following projects then contact us for more information. New projects will be posted as the details become available. The following spaces or properties are under our management but currently leased and unavailable. However you can click through the title for more information on each property. No warranty is given as to the accuracy of the information posted on this site. All information should be independently evaluated for accuracy, correctness and completeness. All information, including pricing and features, is subject to change without notice.